GMA News and Public Affairs—the most internationally-awarded broadcast news organization in the country—has just received an innovation funding grant from the world’s leading online video platform YouTube. The GMA team behind “Stand for Truth”: (from left) Senior Program Manager Nowell Cuanang, First Vice President for Public Affairs Nessa Valdellon, Assistant Vice President Jaileen Jimeno, and GMA News Online Editor-in-chief Jaemark Tordecilla. The grant enables GMA News and Public Affairs to mount a major innovation project involving news. 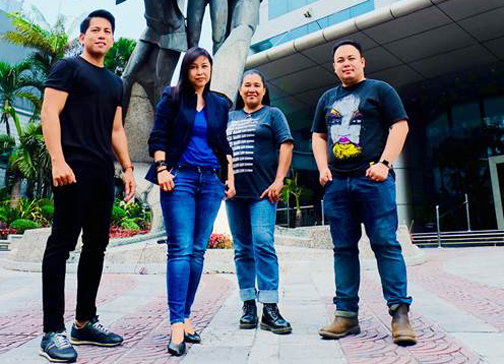 The winning proposal: “Stand for Truth: powered by GMA’s Digital Video Lab”—a weeknight news program produced by the young, for the young­—will contain elements never been used before in traditional GMA newscasts. The newscast will be headlined by a young set of anchors with reporters from all over the country and will be powered by the GMA Digital Video Lab. It will incorporate music, the latest in mobile journalism and new storytelling tools for online publishing. “Stand for Truth” is set to launch a month before the 2019 elections. “This is our opportunity to create a prototype of the GMA newsroom of the future,” shares GMA Network’s First Vice President for Public Affairs Nessa Valdellon. “We will be producing ‘Stand for Truth’ with YouTube’s funding – a newscast for younger viewers which will innovate in its digital executions. We can’t help but be excited!” she adds. Through “Stand for Truth”, GMA News and Public Affairs will train and develop young, principled journalists from all over the country to continue the legacy of the GMA newsroom as they help equally young viewers understand and then take a stand on important issues. Together with Valdellon in conceptualizing “Stand for Truth” are Assistant Vice President for Public Affairs Jaileen Jimeno and Senior Program Manager Nowell Cuanang. The GMA Digital Video Lab, on the other hand, is the brainchild of GMA News Online Editor-in-chief Jaemark Tordecilla. As a recipient of the YouTube Innovation grant, GMA News and Public Affairs further cements its place in the industry as the most credible broadcast news organization in the country. It remains the only Philippine organization to have won the prestigious George Foster Peabody Award—four times at that. It also produces the Philippines’ highest rating news and public affairs programs.